His critics in the Arab world will remember Ariel Sharon as the hardliner known as “Bulldozer,” but within the land he loved, the war hero, military tactician and prime minister’s legacy is secure – as a patriot who embodied his nation’s twin traits of courage and conciliation. To me, Ariel Sharon should be seen as the brilliantly nuanced man that he was. He was a hero and a victim; a superb military strategist and a skilled statesman who succeeded in striking the impossible balance between passionate conviction in his beliefs and the ability to make harrowing compromises for the citizens of Israel. The son of immigrants, Sharon was born and raised in Israel and was instilled with a deep sense of love for the Jewish people rooted in his beliefs in Zionism. By the age of 10, he was already active in youth movements, the early beginnings of what would later become Israel’s Defense Forces. Sharon’s focus never wavered — he was determined to protect and maintain a homeland for the Jews. He was a man who did not just send other people’s children to war and forget about them. Sharon knew the battlefield too well and was well aware of the costs of war. A celebrated general, Sharon was a pivotal player in three major Israeli wars before stepping into the political spotlight in 2001 when he was elected prime minister. And while he rose up as an architect and mastermind behind Israel’s most elite military units and later served a vastly different role in his political career, his focus never wavered: He was determined to protect and maintain a homeland for the Jews. Seeing the need to strengthen and develop his country’s political system, Sharon retired from military service in 1973 and focused his time on developing the Likud Party, a conservative alternative to the long dominant left wing parties, with a strong platform on national security. He served a number of ministerial posts and ultimately served as Israel’s prime minister from 2001 to 2005. Sharon was a force on and off the battlefield; a non-conformist, he often made decisions that were harshly criticized by his own constituents. He was controversial figure in his own country and was widely villanized internationally. Israel’s right wing disagreed with his withdrawal from Gaza and the West Bank in 2005, while the country’s left saw him as too hawkish. The rest of the world saw him as a ruthless military leader, especially after the 1982 invasion of Lebanon when Sharon was eventually forced to resign as defense minister after he was indirectly connected to a massacre of refugees in Beirut’s Sabra and Shatila camps. Later, an Israeli committee of inquiry into the massacre concluded that Sharon as commander of the area should have done more to prevent the bloodshed which was carried out by a Lebanese Phalangists. But what’s frequently missing from discussions about Sharon’s life is the story about the intense yet dedicated man that he was. 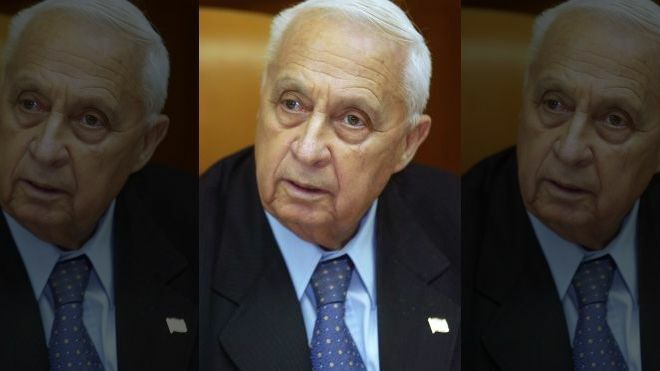 Sharon was known as a hardliner for his conservative, pro-settlement stance, but when it came to paying for the security of the Israeli people, he softened his position. Withstanding criticism from his own political base, Sharon sacrificed his strongly held views on maintaining the integrity of the State and painfully evacuated Jewish settlers from 21 Gaza settlements and from four on the West Bank. He proved to the world that he was a man of contemplative strategy and not a shortsighted ideologue. A man whose political convictions were born out of Israel’s right to settlement was prepared to surrender settlements and land, the State’s longstanding recipe for growth, for a chance at what he believed could mean security for his people. Together with like-minded moderates who supported unilateral disengagement from Gaza and the West Bank, Sharon was forced to break from his Likud political party in 2005 to form a new centrist political party, calling it “Kadima” meaning “forward” in Hebrew. Sharon did not have much time to enjoy this new progressive age. Shortly after reaching his career’s climax, Sharon suffered a mild stroke in December of 2005, followed by a more severe stroke that left him in a coma ever after. Maverick at times and moderate at others, he was a man who knew when to change direction and strategy when circumstances warranted. And in the end, he was still steadfast. It wasn’t a specific ideology or political party that earned his loyalty throughout; it was the people of Israel and their security.